Why the 2013 Volkswagen Tiguan? Our 2013 SEL is a sports car on stilts! It's a pleasure to enter a corner with barely any body roll. then nail the boost earlyand feel the AWD propel you from corners. IF you like doing that sort of thing sitting two feet off the ground, in flat seats. It has the heart of a GTI, and the sports suspension of the SEL model gives it the legs of a hot hatch, too. But that's not why we own it. My wife wanted a car that would tow a one-ton travel traler and still be capable of parking in a conpact-car sized spot downtown. She raves about the turning radius. The Tiguan gives a great feeling of solidity and reassurance. Check out the IIHS rollover test results, available at youtube. It fared best of all small crossovers in their rollover test, with the roof corner deforming only a few inches under 15,000 lbs of force. Looking for a 4-cylinder, compact tow vehicle? We were. Our fiberglass travel trailer is a 16-foot Scamp. With no water tank, fridge or bathroom, it's a lightweight that hits the road packed at approx. 2,000 lbs. We had been towing with a non-turbo Forester, so our first tow behind the Tig was a revelation. All the way from Denver to Leadville, another mile higher, I drove as fast as I desired, within the lower limits of trailer tires. It would be easy to find yourself cruising way too fast with this rig! On the long downhills off the Contionental Divide, the Tiptronic gave strong engine braking, like I'd never expect from an automatic. I've owned over a dozen VW/Audi/NSU cars, so I'm biased. They seem to fit me better than most other cars. Somewhere in Wolfsburg, there's a passenger mock-up with my dimensions. They have all the tech I want, and no more. They look clean and dignified, not overstyled. I have a pair of 2.0T engines, in the Tig and in a 2009 GTI. One is very powerful, and one is extremely powerful. 'Nuff said. Funny how dofferent the gearing is-- the GTI is high-strung, never dropping below 2,400 rpm at cruising speeds, even in sixth. The Tiguan plays it lazy, preferring diesel-like engine speeds. Some owners gripe about this, but it's easy to kick down to lower gears, especially in S mode. It's really hard to come up with a reason to ever need more hp, more displacement or more cylinders than the 2.0T offers. 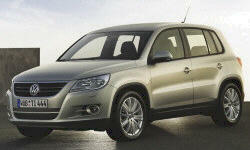 Why Not the 2013 Volkswagen Tiguan? Our Tiguan ranges from 20-30 mpg, between city and highway cruising. It's consistently about 5 mpg thirstier than the GTI. Blame the extra weight, but there's less than 400 lbs of that, IIRC. Or blame the AWD, but it's part-time only. I blame the large aero cross-section; it stands about a foot taller than a Golf. If VW would offer a TDI in the Tiguan, they'd sell as many as they could spare to the US market. I'd be standing in line. Michael's knocks on the nav system are right on. Without a larger view beyond the mile around me, I'd still need a map of an unknown area. And I despise touchscreen controls in cars, so this one is no pleasure. Simple tone control adjustments require five precise button pushes to perform. Compare that to the clear, tactile reward of turning a knob. If you decide to decline Sirius service, you're forever stuck with a promotional pitch that plays whever you switch between AM and FM. The screen is poorly shielded from the sun, and it's too dim in the day and to brigt at night. Whats; rhe reward for all these ergonomic compromises? Mediocre sound quality. Voices on AM are thin and harsh, like a cheap pocket radio. Despite tone adjustments (while parked), I can't approach the splendid quality of my GTI's system, which has two additional midrange speakers. That speaks for itself. My wife saw an ad for the Mercedes CUV, at a better price. "We bought a VW for more than a Mercedes-Benz?" she asked sardonicaly. "Yes, but it doesn't have the VW's goodies." The Tiguan's frills quickly feel like necessities. You NEED the micro-adjustments and seat-cushion tilt of the power seats. My teen driver needs the backup camera. The sunroof is a marvel. And aren't those the best headlights ever, bending 15% so I can pretend to schase them around curves? On a dark road, the left-side high beam rises high as the left, spotlighting that roadside deer you wouldn't see with a fixed high beam. A base Tiguan, in the low $20Ks, probably makes more sense than a Golf. You get a better engine and more interior space, even wothout the options. At the cheaper end of the range, the Tiguan is a smart alternative to a Golf or Jetta Sportswagen. You get a German-built vehicle that's rare enough that you'll never miatake ot for another one in the parking lot. Pile on the options, and you almost-Audi levels of equipment, without Audi's superior styling. Our Tiguan gives me mixed feelings. It's versatile and does almost everything well. In the first year, it's been reliable and trouble-free. But every time I have a choice, and I don't have a cargo-hauling task in mind, I choose my GTI instead. I'll probably never grow fond of the SUV driving position. Even with the seat slammed, I'm sitting too high. The height increases the uncomfortable pitching when the car follows the tilt of the the road. And as every go-kart driver knows, the lower you sit, the faster you feel. My last car, a New Beetle, needed a one-inch lift to feel and drive just so. If the tiguan was my everyday car, I'd be looking for a kit to drop it a few.